First, we want to say how happy we are that you’re interested in training with us. We hope you’ll join us. Whether you stay for just one session, or train for years, we look forward to practicing harmony and balance with you. We’ve pulled together some answers to questions that new students often ask. You are always welcome to contact us and ask other questions. 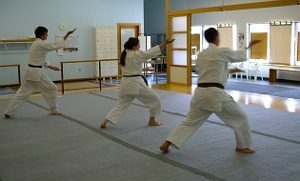 What are Aikido classes like? Our classes start and end with bowing. We bow to show our respect and thanks for the space, the Aikido teaching, our instructors, and our fellow students. When it’s time for class to start, the senior student will ask everyone to line up along the back of the room. We then go into kneeling and bow to the front of the room, and then bow to the instructor. The senior student will talk you through all of this. 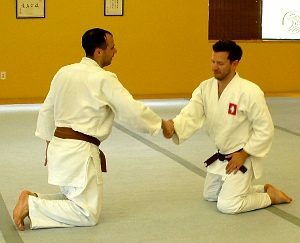 We also bow to our partners when starting and ending techniques. Rolls and break falls: we practice rolls and break falls to help us fall safely and get back up again. Weapons: in beginning classes, this is usually the bokken, or wooden sword. We also practice with the short staff, jo, and the dagger, tanto. Hand techniques. In the hand techniques, we typically work with a partner or small group. We practice both being the person doing the technique, and being the person receiving the technique. 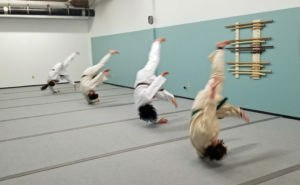 The instructor demonstrates the technique and walks the class through the steps, after that, partners practice the technique on their own. Class ends with lining up and bowing just as at the beginning of class. Once class is dismissed, students find the partners they worked with during class and bow one last time to thank them for the practice. We recommend any athletic clothing that lets you move easily. We do rolls and falls on the mat (you’ll learn to do these safely) so long pants and long sleeves are the most comfortable. We train barefoot. Please don’t wear any dangling jewelry or clothes with buttons, snaps, or zippers. Do I need to bring any special equipment? Nope! Just bring yourself! We have wooden weapons that students can use during training. Is there space to store my things while I’m training? We have a small bench and shoe rack outside the space. Please remove your shoes and leave them here before entering. Inside our dojo, there are shelves for you to store bags, coats, or other personal items. Can I change clothes there? Yes you can. We do not have changing rooms in our dojo, but there are bathrooms just down the hall from us. The bathrooms are large and clean and many students choose to change there. Many other students arrive already dressed for class. Where are you located? Where should I park? We are in Northeast Minneapolis in the Waterbury building at 1121 NE Jackson St, Minneapolis (map). Our dojo is suite 118. There is a free parking lot on the east side of the building (on Van Buren street). 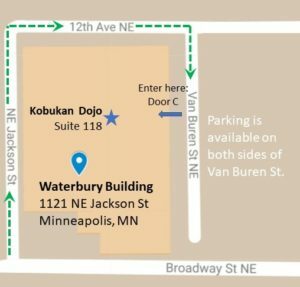 From Broadway St, turn north on Jackson St. and then drive around the building to Van Buren St. Park in the lot there, and enter through door C. We’re a few doors down the hall on the left. Our dues are generally paid monthly (the exception is our Introduction to Aikido class, which is 2 months). 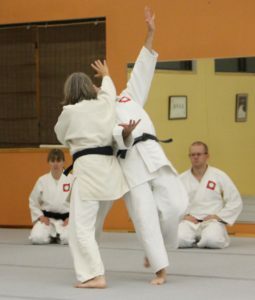 Aikido Yoshokai of MN is a non-profit organization and our instructors are all volunteers. Our dues go directly to keeping the dojo open and running. Youth (Saturday mornings): $40 / month. Once Weekly All-Level (one Beginner or Mid-level class per week): $50 / month. Unlimited All-Level (unlimited Beginner or Mid-level classes per week): $65 / month. Advanced (unlimited classes per week including advanced): $85 / month. If you are new to Aikido, we recommend taking our Introduction to Aikido class on Saturdays from 12:30 – 1:30 pm. If you’d like to train more often than that, it is $65 per month for unlimited beginner / all-level classes. 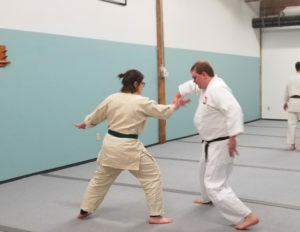 If you choose to do the $65 per month, you can take the Introduction to Aikido class as part of that (you don’t need to pay twice). We prefer that you register and pay dues online. Do you have youth classes? Yes, we do! Our youth class is for kids age 7-14. It meets on Saturdays from 11:00 – 11:45 am. 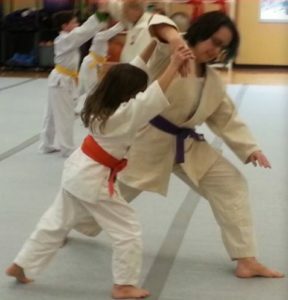 Youth classes follow the same structure as our adult classes, but are taught at an age-appropriate level. The cost for our youth class is $40 per month. Youth students study the same movements and techniques as adults, but at an age-appropriate level. Ask us, we are happy to answer any questions you may have. 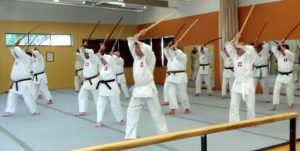 Email instructors@aikidomn.org or call us at 612-424-2156.